>>> beautifully-engraved music to see what the publishers' practice is. >> own font and we design it the way we like it. So, examples or rationales are welcome. > is probably consistent with a hand-engraved look. note to my eyes when the flag and the notehead are not discernible. after this flags issue is finished. >>> Is there a reason you haven't uploaded the patch to Rietveld for review? > Once you get to that point, just hit the escape key, then type :wq. > You are in vim, or some equivalent editor. > prefer, I'll be happy to post the patch for you. chorales posted recently are full of these). > 'lengths' and 'stem-shorten', to hold your adjusted values. 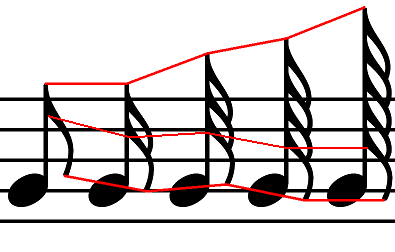 > how much to lengthen a stem to avoid other note-heads, for example. Ah, i see. I hope to be able to change these two tomorrow morning. > I like the new shapes. > various documents will show where and when the new flags can be used. I'll gladly compile any example you provide. > forced directions, especially for the head-facing part of the flag. 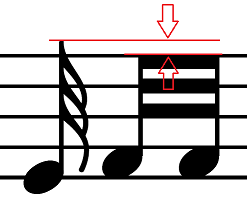 Do you mean the difference marked in attachment ("tip difference.png")? > example, it seems all forced stems are getting shorter than the beams. are equal. 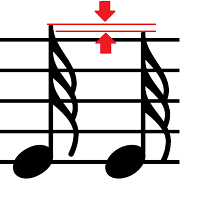 No flagged note is shorter than corresponding beamed one. Are you sure that you haven't switched the files when comparing? > lengthen the hooks a bit more. > perhaps you uptune that correction for the shorter up flags. And by 'outer' do you mean topmost or bottommost? >> (as for the c++ code - i'm totally aware that it needs improvement. > them; it will make your experiments easier as well.